A few questions: When consumers find out this was a hoax, does this create distrust? Does tapping into market memes demonstrate being in tune with your market? Would it have only worked in a country where a large portion are not religious? 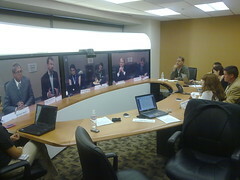 Left: Several Press, Analysts, and Bloggers met with executives from Cisco and Warner using Telepresence from NY, SF, to San Jose. Cisco’s Eos (their community platform for media brands) landed an enterprise wide deal with Warner Music. Attendees included John Chambers, CEO of Cisco, Dan Scheinman who heads Eos, and Edgar Bronfman, CEO of Warner music and Michale Nash of Warner. Rather than focus on the details of the deal (you can read WSJ, Reuters, and GigaOm), I’m going to discuss what it means to the industry at large. Media companies know that they’re not the only voices in the auditorium –the audience now talks back. They create media, content, and share it directly with each other on social sites —now brands, like Warner seek to embrace them closer. Rather than allow this inevitable social interaction on social networks like MySpace, they want to take it back by launching their own social features. Although EOS was announced earlier this year (read my take), this is their first major client, hence the fanfare. What’s taken EOS so long to clinch a large deal? Their hefty enterprise system is designed for media brands to cascade across multiple properties –not one-off installations. Community platform players that also compete in the media space like Kickapps and Pluck (and to some degree Ning) have self-serve features, are modular, and even have credit card payment systems so individual brand managers can get started –bypassing IT. Incumbent community platform players (learn more about this crowded space) like Kickapps (who power artists U2, Madonna and Food2), Pluck (who powers USAToday/Gannet, The Guardian, and the NFL), and incumbent CMS systems like Vignette, Documentum, Interwoven need to demonstrate they’ve enterprise viability by proving their systems to brands that can scale across multiple entertainment properties at media conglomerates. Warner is an ‘end to end Cisco customer’ so the aforementioned vendors should immediately reach out to their customers with a large Cisco footprint in the datacenter. As media companies develop their own communities this takes some power away from social networks like MySpace, Bebo, and Facebook. Fortunately, not all fans will interact with artist created communities –so they will need to quickly distinguish how their community base is different (perhaps in a different part of the marketing funnel) –but still valuable. Consider this the first day in which Chief Media Officers recognize that social is a key component to fostering a brand amongst an audience that wants –and will talk back. Expect other media conglomerates to start this evaluation process. Rather than punt the community to MySpace and Bebo to monetize, media companies can now aggregate the data from the community to quickly identify trends, memes, and hits and wins from the community. Artists can foster a tighter relationship with fans as the communication goes both ways. They could monetize by providing premium products (exclusive content, backstage passes, or special venues). 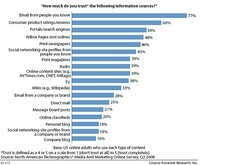 Additionally there are WOM opportunities, and harvesting data to identify new trends, top influencers, and market trends. Creating premium products for fans and evangelists will spur their business forward. Media companies need to develop a strategy beyond technologies that encompasses dealing with process, roles, and allowing for the voices of the customer –not just the media brands. Remember my 80/20 rule about communities, only 20% is about technology, the majority is strategy. Lastly, media companies will need to reformat their business model, as the people formerly known as the audience now join artists on stage. Given how media companies have responded to this movement with a clamping and silencing motion –this is a big change for their culture. Summing things up, media brands that recognize the party is happening without them on MySpace, Bebo and Facebook will build branded communities for fans and artists closer to the corporate domain. This means the structure of the business will need to change, not just to allow fans to participate on the ‘online stage’ but to also develop new ways of monetizing through premium products, cross sales, and lean on efficient word of mouth marketing. I’m on a Twitter hiatus and am not tweeting for a while, instead, I’m focusing on what Forrester calls energizing, what others may refer to as “word of mouth’. So instead, I’m going to conduct experiments to help my clients understand how to best use social tools to allow content to spread for person to person. While social media ‘chicklets’ already exist that make it easy to make blog posts diggable, tagged on delicious, or emailed to others, we’ve often forgotten to recognize one of the most powerful behaviors: the retweet. As a result, every single one of my future blog posts will have easy-to-use, copy and paste content that is designed to be rapidly tweeted to your followers –or until a technology emerges that makes it easier. So How Bloggers Should Inspire Retweets? Make it easy for their readers to tweet it, by creating simple copy and a shortened URL and include it at the bottom of each blog post. Thanks for tweeting, and retweeting this.